Advances in Environmental Accounting & Management aims to advance knowledge of the governance and management of corporate environmental impacts and the accounting for these, including issues related to measurement, valuation, and disclosure. It also aims to increase the awareness of management, accounting practitioners, investors and other stakeholders of the financial and social consequences of corporate environmental impacts, encouraging greater environmental accountability and responsibility. The first chapter in this volume (Dr Yousuf Kamal) is set in the context of the Bangladeshi garment industry, while the second chapter (Delphine Gibassier) explores the practice of water accounting. The remainder of this volume presents three chapters from the 3rd French Conference on Social and Environmental Accounting Research, guest edited by Sophie Giordano-Spring, Jonathan Maurice and Charles H. Cho. 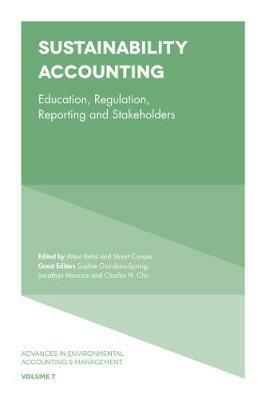 These chapters consider sustainability in Canadian CPA teaching programmes (Emilio Boulianne and S. Leanne Keddie); mandatory environmental reporting in France (Juliette Senn); and CSR reporting practices in Brazil and South Korea (Hyemi Shin and Adrian Zicari).